Western blot analysis of whole cell lysates probed with POLR2A antibody followed by detection with HRP conjugated Goat anti Mouse IgG (1/50,000, STAR207P) and visualized on the ChemiDoc MP with 26 second exposure. Arrow points to POLR2A (molecular weight 250 kDa). POLR2A antibody recognizes RNA Polymerase IIA, also known as DNA-directed RNA polymerase II subunit A, RPB1 or RPO2. Mouse anti Human POLR2A antibody recognizes RNA polymerase IIA, also known as DNA-directed RNA polymerase II subunit A, RPB1 or RPO2. The POLR2A gene encodes the largest subunit of RNA polymerase II, the polymerase responsible for synthesizing messenger RNA in eukaryotes. The product of this gene contains a carboxy terminal domain composed of heptapeptide repeats that are essential for polymerase activity. These repeats contain serine and threonine residues that are phosphorylated in actively transcribing RNA polymerase. In addition, this subunit, in combination with several other polymerase subunits, forms the DNA binding domain of the polymerase, a groove in which the DNA template is transcribed into RNA (provided by RefSeq, Jul 2008). 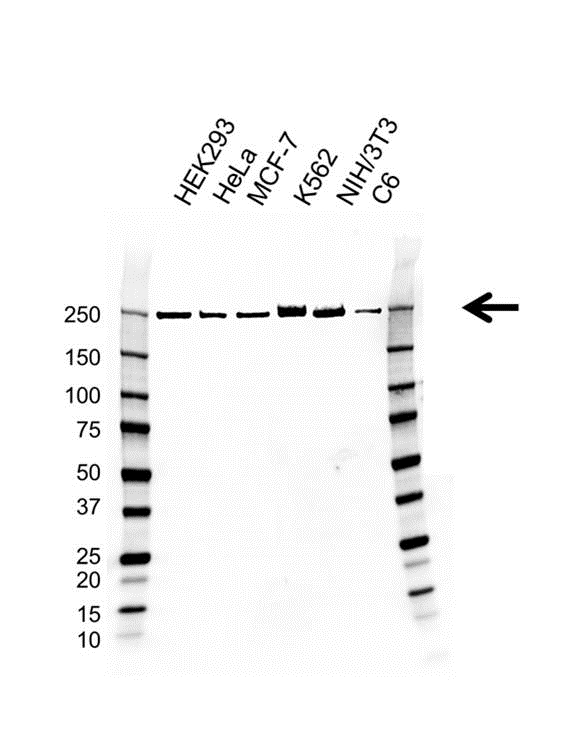 Mouse anti Human POLR2A antibody detects a band of 250 kDa. The antibody has been extensively validated for western blotting using whole cell lysates.